I don’t want to spend this entire opening talking about the movie I’ll be reviewing in a moment, so let’s get started. Two of my favorite films are about to duke it out. This is: VERSUS. FIRST IMPRESSIONS: Okay, so let’s face it, as much as we want to deny it the first impression is the one that counts. People want a movie to have a fantastic opening, so that they can tell all of their friends about it. Isn’t it so cool to be able to do that, to just walk up to a buddy and let those first few minutes of Raiders of the Lost Ark, Star Wars, or Casino Royale roll off your tongue? It gets them pumped to go see it, and gets you pumped to see it again. The opening scenes of a film are crucial for Man to be entertained. So which of these two films has the better opening scene? All right, let’s start with Fight Club. As great as it is to watch the end of the film at the beginning, if the ending is made awesome by the crescendo leading up to it, don’t do it. If the ending of a film can’t stand alone as chilling or impressive, it shouldn’t be done. Don’t get me wrong, the opening of Fight Club is fine. It justs feels a bit slow and sleepy to me. It’s funny, but not exactly as awesome as the opening of the opponent. The opening scen of Inception is intense. The music and atmosphere are established right away and feeling of darkness and mystery overcome you immediately when it begins (or at least that’s how it was with me). Even though you don’t know what’s happening, you’re hooked, and when Cobb and Arthur are pulling of a heist in a collapsing dream, it’s pretty cool. Isn’t it ironic that both movies I picked begin at the end? Or is that coincidental? Ah, whatever. Hopefully some grammar Nazi will show up and correct me. Anyhow, the point goes to Inception this time around. The opening was just more fulfilling. CAST: Okay, now let’s get down to what actually may be the hardest decision in the whole article: the cast. The reason it will be so hard: these were two amazing casts. I want that clarified before I say anything negative about them. With that said, let’s do Inception first this time. Holy Christ was the casting director for this film awesome. I always for some reason get ticked when I see Leonardo DiCaprio doing a good job, but whatever. He was pretty awesome in this film, creating a strong main character who, though conflicted, certainly has good intentions. Some people may say that they predicted the choice Cobb (DiCaprio) would make near the film’s end when having a certain meeting I won’t spoil here, but I honestly couldn’t tell what he was going to do. He seemed very split between both possible decisions, and I was real happy about that. The supporting cast was great too, with Joseph Gordon-Levitt (playing Arthur) being my favorite of them. He was spot on when playing the paragon member of the “dream team.” (Oh God, did I just say that?) Ellen Page as Ariadne was good, mostly playing a character who was much like the audience: curious and wanting to understand what was happening between Cobb and his subconscious. The rest of the cast was great as well, mixing in enough comedic relief while still remaining serious throughout the picture. Now, Fight Club’s cast is a bit trickier to judge against the opponent’s. For one thing, it’s smaller. It instantly has a disadvantage now. 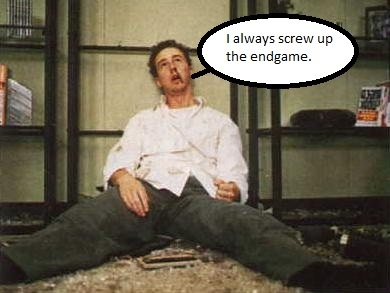 However, having one of the greatest actors of the past two decades, Edward Norton, kind of helps. Oh, as well as Brad Pitt. Even though he has that whole, “he’s just playing Brad Pitt as a psychopath,” thing going on, he’s still a good actor. So, did the cast do well here? Hell yeah they did! Dude, I don’t like “geeking out” mid-review, but Ed Norton as an insomniac cubical worker is probably one of the most hilarious things in the world. Every line that came out of his mouth either had me cracking up or had me going, “Damn!” It was awesome. Also, I don’t care if it’s just Brad Pitt playing Brad Pitt, his delivery was spot on. Everything he did in this movie as Tyler Durden makes him one of the most memorable characters in cinema. A phenomenal performance behind a phenomenal character. Now, about Helena Bonham Carter. Look, I know she’s supposed to be a psycho (and don’t get me wrong, she did a fine job as well), but there’s one thing that’s off. She started out as the craziest person in the whole movie, and then all of the sudden by the end she’s telling Ed Norton that he’s certifiably insane? What? Maybe I’m being picky, but that really did bug me. However, it didn’t take away from the quality of the cast one bit. And Robert Paulson, we will miss you (inside joke: go see the movie). The point goes to Fight Club this time around folks. Congratulations! DIALOGUE: What’s a good movie without lines you can’t repeat to your friends until they want to split your head open like ripe melon? I’ll tell you what it is: Wall-E. Anyhow, now that we have that bad joke out of the way, we may proceed. The script for Inception was good, but I’m not sure it was better. In fact, in my opinion, it wasn’t. It was definitely poetic and has a lot of style and humor to it, but Fight Club’s script is on a whole different echelon. It is practically a thesis, to be honest. Therefore the point goes to the soap maker this round (another inside joke). DIRECTION: Christopher Nolan has never, as far as I’ve seen, done a bad film. Memento was good, The Dark Knight was good, and his latest masterpiece is a great work of art. The set pieces are stunning, the effects are beautiful, and the way the tale of Cobb is told is fun and exciting all the way through. When the “dream team” (ugh…) finally begins their big mission halfway through the film, you can feel the intensity of the job they’re about to pull off just in the way they look at each other. It’s really fascinating. And of course who could forget that ending. Seriously Chris, that was just priceless. I hope you never tell us what happened, so that it’ll always be awesome. Fight Club was directed by David Fincher. For those of you who don’t know, he’s the guy who directed The Curious Case of Forest Gu– oh, I’m mean Benjamin Button, oh, and some movie about Facebook or something. It probably sucked. Anyhow, he definitely did a nice job with Fight Club. It was very dark and very tense, but maybe a little too dark. Sometimes I wished, while watching it, that it would lighten up a bit. I like dark films, but this was pushing past Watchmen level at some points. Because of the above stated, I’m afraid the direction award goes to Inception. Sorry Fincher. Maybe your movie about that girl with the dragon tattoo will be less dreary. THE STORY: The story of a film is generally pretty basic in nature, and then elaborated on by the presentation of that story. Inception has not only an elaborate presentation, but an elaborate tale as well. The story of the mind being the scene of a crime has so many layers that it’s often hard (for some viewers) to keep track of it. Oftentimes I’ve been told that nobody can get it the first time through, even though I can attest to that statement being completely false, considering I did. I’ll admit I noticed new details after I saw it five more times (don’t judge me), but to be fair it didn’t change dramatically. Fight Club’s story doesn’t really pick up until the meeting with Tyler Durden, and though a well presented tale you don’t really understand it until very near to its climax. That’s how it was for me, anyway. I love the movie, don’t get me wrong, but there’s just some stuff that comes up in the story that isn’t worth it until the end. And even though it kind of works with this film, for me some things didn’t. I’m trying not to spoil anything so I won’t give my one perfect example of this, but anybody who has seen it probably remember’s the scene in the car when Tyler and Ed’s character have that argument. After seeing the ending, does that scene make any sense? No, it doesn’t. And so the tie is broken. Inception wins the bout! Thanks for reading! Be sure to return for more! “…probably read my revied of Inception.” <- Wrong. "…case anybody doens’t know" <- More wrong. "…It came out during a time when being against “political correctness” was far off and [it] went in that exact direction." <- See annotation. "…defying all that Man, at the time, had accepted as 'right.'" <- Don't be so cliché. ('clichéd' does not need to be used, as cliché is an accepted usage(that I prefer)). Also, I contest your debate. Fight Club was directed in a much more stylized manner that kept you in the dark until the end. Literally, In the dark. I fixed some of those, but in a few cases I’ll NEVER GIVE IN! GOOD DAY, SIR!